Drs. Alexander and Kavita Shor are Seattle’s specialists in implant dentistry. In this article Drs. Shor will discuss most important information about dental implant treatment. Despite preventive efforts some of us still loosing or missing teeth as a result of dental diseases, traumatic injuries, congenital malformations, and oral tumors and cancers. Systematic attempts to replace missing body structures with implanted devices were initiated during last century. In 1952, Swedish professor Dr. Per-Ingvar Branemark discovered integration between titanium metal and mammal bone. Further research by his group led to the formulation of the concept called osseointegration, which is defined a direct interface between implant and bone. This revolutionary discovery and further contribution by scientists from various disciplines gave rise to the practice of modern implant dentistry. In its present form implant dentistry is an advanced science and practice of tooth replacement with artificial biomaterials as well as synthetic and natural products for the regeneration and maintenance of the jaw bone. Modern dental implants are designed as a screw like devices. They can support dental crowns, dental bridges, and removable dentures. The outer surface of the implant is designed with special threads and surface characteristics so they can form a strong bond with the supporting bone.The inner chamber of dental implant includes threads in order to accept screws which hold artificial restorations and prosthetic components. Dental implants come in various geometries, lengths, and diameters in order to accommodate for the various anatomic situations of the jaw bone and teeth they are replacing. 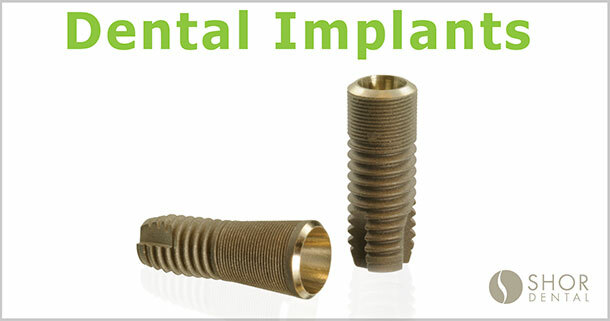 Dental implants are commonly used for the replacement of one tooth. In comparison to the dental bridge it is a more conservative option since it does not require irreversible removal of tooth enamel on the adjacent teeth. It is also better accepted than removable dentures since it feels just like a natural tooth it replaces. Dental implants are also commonly used for the replacement of several missing and hopeless teeth. 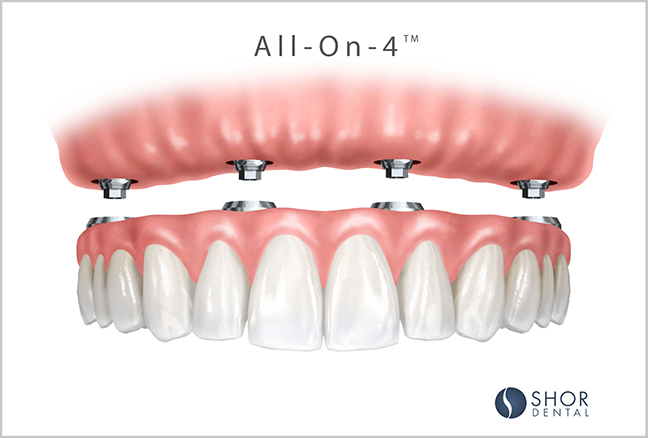 Typically two or more implants can be placed to support individual crowns or dental bridges. There are also instances where one implant can support two missing teeth. Dental implants are also routinely used for the support of removable dentures. 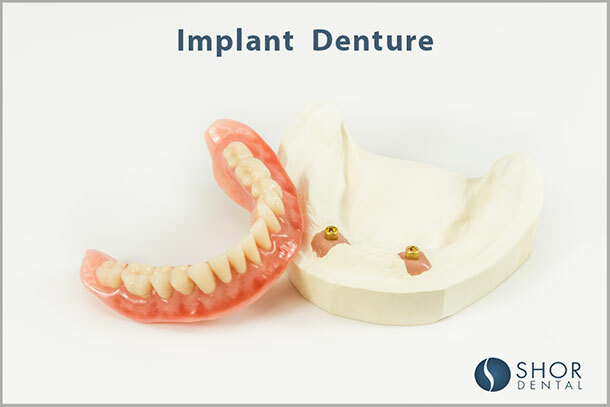 One, two or several implants can be used for the stabilization of the dentures. Addition of the dental implants allows for better chewing function, improves comfort and quality of life for the patient. Dental implants can also be used for the replacement of all teeth in one or both jaws. Four or more dental implants are placed into each jaw. Artificial restorations which replace missing teeth can be designed as bridges or dentures. In addition to replacement of natural teeth, this type of treatment also replaces missing gums with artificial materials. Trauma to the teeth and jaws, congenital disorders, tumors and cancers of the jaws can result in missing teeth and large defects in the mouth and face. Dental implants are also used for the reconstruction of missing teeth, soft and hard tissues of the mouth and face. Dental implants are well tolerated by patients and there are only few contraindications. Dental implants are contraindicated for patients who have certain poorly controlled medical conditions and will not be able to tolerated oral surgery well. Dental implants can be also contraindicated for patients with certain medical conditions which affect healing and jaw health. Dental implants are contraindicated for patients who have allergic reaction to dental implant materials. In some instances dental implants may be contraindicated for younger patients who are still growing. 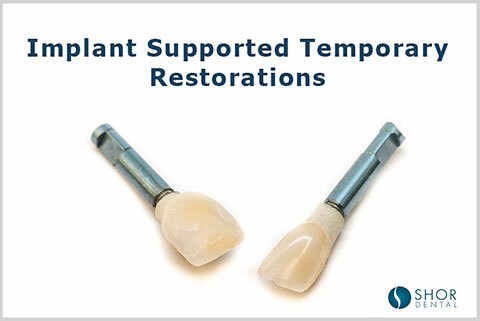 In such instances implant treatment may be delayed till the completion of the patient’s growth. Some of the most common questions about dental implants include success rate and longevity of the implants. Dental science documents high success rate of the dental implants- typically in the area of 95%. Success rate can be slightly lower for patients who have certain systemic diseases and for active smokers. Longevity of the dental implants and restorations depends on a number of factors. Majority of dental restorations perform very well over decades of service. In some instances you may experience a higher rate of complication due to the tooth grinding. Every patient is unique and we encourage you to ask about your specific condition and risks. Treatment with dental implants typically includes several steps and stages. In the initial diagnostic and planning stage, condition of the patient is evaluated and treatment options are presented to the patient. In this stage clinical evaluation is often supplemented with diagnostic models, diagnostic wax-up, and conventional and 3-D radiographs. During surgical stage of treatment, hopeless teeth are extracted if present. Additional grating procedures are performed if necessary and dental implants are inserted into the jaw bone. Dental implants are than allowed to heal. If there is a need we may also fabricate a temporary restoration for the replacement of missing tooth or teeth. Surgical stage of treatment may typically take 6-8 weeks in straightforward cases and 1 to 1.5 year in a more complex cases which require jaw bone reconstruction. 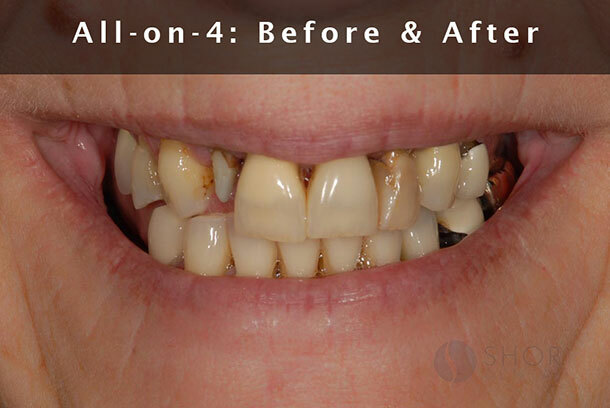 In the last stage of implant treatment we fabricate the final restoration. Depending on the nature of the treatment production of the final restoration may take somewhere from several weeks and up to several months in more complex cases. In some instances your jaw one volume may not be adequate for the dental implants. In such situations bone grafting is performed. Bone grafting can be done as a separate procedure or at the time of dental implant placement. In some instances there may be a need to increase the volume of the gums which surround dental implant. Just like bone grafting, gum grafting can be done as a separate procedure or at the time of dental implant placement. Often the sinus cavities may preclude preclude placement of dental implants in the upper back areas of the mouth. Sinus is an air-filled space and dental implants need to be surrounded by solid bone. A sinus graft includes placement of the graft material into the sinus cavity. Dental implant carries a low risks of complications. However complication do occur and we categorize them into surgical and prosthetic types. Later in service dental implants may also experience loss of the supporting jaw bone. Although rare this condition may compromise appearance of the restoration and lead to implant failure. Just like with natural teeth, dental implants require regular check up and maintenance. During recall appointments condition of the dental restoration and health of the supporting gums and bone are evaluated. Periodic x-rays are taken as well. Do You Want to Learn More About Dental Implants from Seattle Specialists? In the below mentioned articles Seattle Implant Specialists Drs. Shor discuss different aspects of implant treatment. Why Choose Shor Dental for You Implant Needs? Drs. Alexander and Kavita Shor received specialty training in implant dentistry while in prosthodontic residency at the University of Washington in Seattle. Drs. Alexander and Kavita Shor wrote numerous clinical papers in the area of implant dentistry and dental technology and both of them are on faculty at the University of Washington. Both Drs. Shor have years of experience in the area of tooth restoration and tooth replacement with dental implants. Drs. Shor perform comprehensive and detailed evaluation of your condition and formulate treatment options which address your needs and desires. Please call us to schedule your appointment and learn about your treatment options!